Shipped +4°C Ice Packs, Store at Store at -20°C for up to 1 year. This assay kit carries the LSBio 100% Guarantee. Glucose uptake in Jurkat and HeLa cells. 2.5E5 Jurkat cells were treated with or without 4 µl Phloretin (1X concentration) for 45 min. After treatment, cells were washed and incubated with Glucose Tracker Reagent, Glucose Tracker Enhancer, and the same concentration of Phloretin for another 30 min. according to the kit protocol. 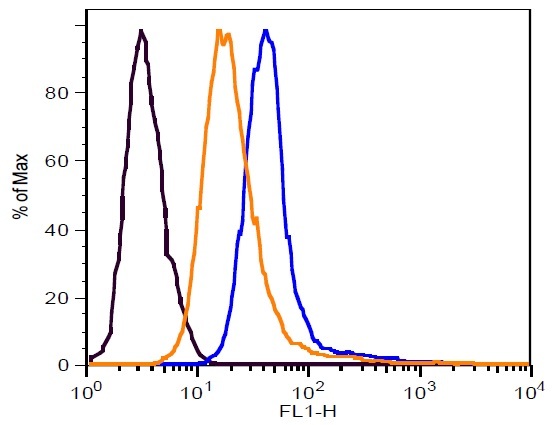 Comparison of histogram from flow analysis showing the inhibition of glucose uptake by Phloretin in Jurkat cells (Black: negative control cells; Orange: in the presence of Phloretin; Blue: without Phloretin). Glucose uptake in Jurkat and HeLa cells. 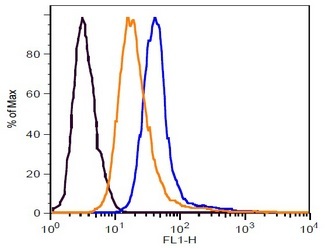 2.5E5 Jurkat cells were treated with or without 4 µl Phloretin (1X concentration) for 45 min. After treatment, cells were washed and incubated with Glucose Tracker Reagent, Glucose Tracker Enhancer, and the same concentration of Phloretin for another 30 min. according to the kit protocol. A. 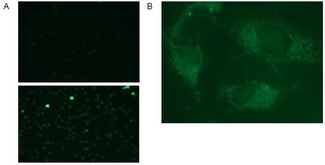 Images of Jurkat cells obtained using fluorescence microscope (Top: treated with Phloretin; Bottom: without Phloretin treatment). 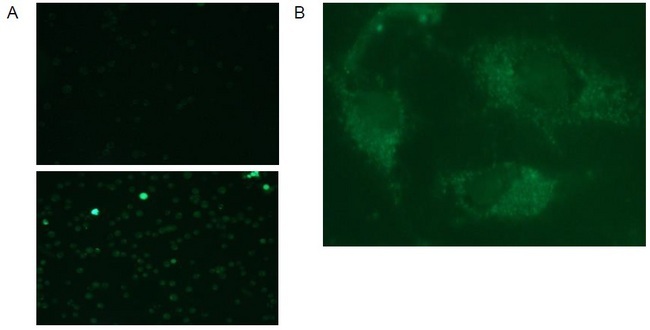 B. Glucose Uptake in HeLa cells: HeLa cells showing the uptake of Glucose Tracker Reagent in the cytoplasm. Cells were stained with Glucose Tracker Reagent for 30 min. and fixed. Image was taken using a fluorescence microscope with a 60X objective lens.